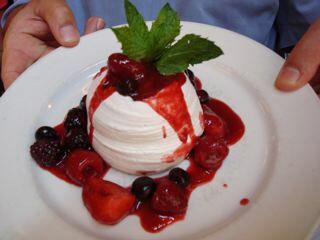 The Pavlova at Balthazar is baked meringue filled with yogurt and mascarpone served with a silky warm berry sauce that is made to order. The meringue dissolves on your tongue, and with the sweetness of the meringue, the creaminess of the marscapone, the tart balance of the yogurt and the heavenly warm berries, this is really exceptional. John tells us that we are not the only ones who think so. Happy Bastille Day! Balthazar, definitely! Although I always have a chocolate thing. One would think that would be boring by now, but it’s an addiction..Will try the Pavlova next time…promise. Next Next post: the pink blinQ!